Everyone’s heard the most common prescriptions to clear up your skin. Magazines recommend products based on your skin type: oily, normal or combination. You can vary your face wash, your blemish cream, or your lotion to adjust to the season. You can avoid certain foods, and be extra vigilant at certain times of the month. I’ve read article upon article on how to achieve clear skin. New gadgets are constantly popping up from the Clarisonic cleanser to at-home light treatments. And yet, despite our careful precautions, we still break out. What gives? Recently I read an article that revolutionized the way I thought about my skin. It’s not just something that’s there to apply makeup on, exfoliate, and lotion up every day. It’s a living, breathing organ that wraps your entire body, has miraculous healing powers when you scrape it up, and can be a reflection of your overall health. We have all noticed the correlation between a poor diet, no sleep, and acne. Yet past overindulging in greasy food and beers on a holiday and the following break out, I never thought of my skin as a reflection of my overall health. The Chinese, however, have been in tune with the skin’s ability to relay health problems before they get serious, for years! The first place an illness may manifest is the ever-so-sensitive skin of the face. A blemish on the face, may indicate a corresponding weakness in the matching part of the body. The Chinese facial map links each area of your face to a different area on your body. The list goes like this. Forehead: Breakouts occur most often here when you are experiencing digestion, stomach or bladder trouble. A return to simple, natural foods like vegetables and lean protein can straighten things out. Eyebrows: The space above the bridge of your nose and between your eyebrows is ruled by your liver. A line in between your eyebrows can signal that you’ve been over-indulging in the sauce, or eating too late at night. Food after 8pm stresses the liver. Nose: Blemishes on the nose give away issues with the stomach, spleen and pancreas. Cheeks and Neck: These areas are the most sensitive to stress. Spikes in stress reflect the most in these areas. Cheeks can also reflect issues in the lungs (on the right cheek), liver (on the left cheek), gums and teeth. Working out a half hour a day can cut out breakouts in these areas by minimizing the cortisol rush causing these blemishes. 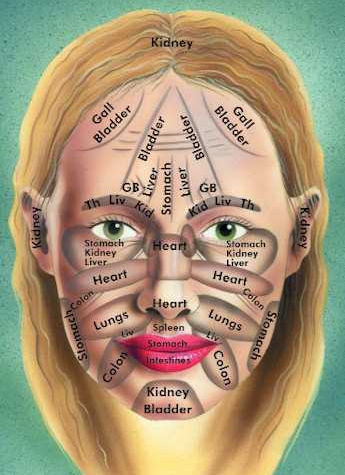 Chin: The sides of the chin are connected to the kidneys and ovaries. This area is most likely to breakout at a certain time each month. The center of the chin links to the small intestine, blemishes in this area may demonstrate an issue with digestion.